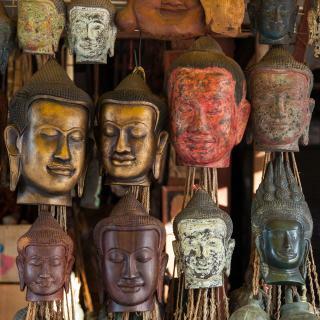 Looking for deals in Siem Reap? Nestled in peaceful location amid private gardens, Ladear Angkor Boutique offers elegant and comfortable accommodations away from the hustle and bustle of Siem Reap. Location is very convenient! Walking distance from bars and restaurants. The hotel is spectacular and the rooms are super clean and spacious. The staff were super kind and helpful. Nestled within private gardens, Borei Angkor Resort & Spa offers spacious Khmer-style accommodations in Siem Reap. It features an outdoor swimming pool and guests can enjoy meals from 4 dining... Borei Angkor is beautiful, clean and peaceful, the staff extremely helpful, and the pool and spa AMAZING. Perfect experience. Located in Siem Reap, G&Z Bliss D'Angkor Suites has free bikes, outdoor swimming pool and free WiFi. Staff was so kind, helpful, and welcoming! Out of the 5 countries we visited in Asia, Cambodia was our favorite and I really think our Hotel stay here had a lot to do with it. Breakfast was delicious, facility was clean, price was AMAZING. Have been telling friends and family about this location strongly recommend it to anyone. Featuring an outdoor swimming pool, Khmer Mansion Residence offers rooms in Siem Reap, an 18-minute walk from Pub Street and 1.3 miles from King's Road Angkor. Everything was absolutely amazing! The staff made you feel at home! The food was grate and the room was definitely the highest level we visited. The smart TV was just great.!! Try to get rooms before they raise the cost. Because this hotel is a lot more than 4 stars hotel!! Located in Siem Reap, a few steps from King's Road Angkor, Blanc Smith Residence has an outdoor swimming pool and a garden, as well as free WiFi. Very nice location. Excellent staff and service. Very helpful. Pool is very clean. Would definitely stay here again if we come back. Naga Gate Boutique Hotel greets guests with a welcome drink, cold towel, and fresh fruit skewer. Staffs were really accommodating and helpful. Featuring an outdoor swimming pool and free WiFi, Aroma Angkor Boutique Hotel is located in Siem Reap, a 12-minute walk from Pub Street. The front desk is very friendly. The breakfast has multiple choices. Located in the heart of Siem Reap, Golden Temple Boutique offers 19 suites tastefully designed in a handcrafted stonework decor. I liked everything about this hotel. Located in Siem Reap, a 9-minute walk from Pub Street, Monthara Angkor Residence features views of the garden. Each room at the 4-star hotel has city views and free WiFi. Absolutely everything. The staff was super kind. Set in a quiet neighborhood in Wat Bo Village, Gold Smith Residence offers residential-style accommodations with complimentary WiFi in all areas. I’ve been traveling for a month now and this was my favorite place so far! Set in Siem Reap in the Siem Reap Province Region, 0.6 mi from Pub Street, Green Amazon Residence Hotel features an outdoor pool. Wonderful and friendly young staff members. Spacious very clean room. Nice swimming pool. Located in Siem Reap, 2625 feet from King's Road Angkor, Grand Élysée La Résidence features free WiFi access and free private parking. I stayed at this hotel one night for my business trip but I felt warm with smiling face. The Khmer House - Secret Oasis is located in Siem Reap and has an outdoor swimming pool and a garden. Featuring free shuttle service, this property also provides guests with a terrace. Exceptionally clean, stylish and gorgeous property - incredibly helpful and attentive staff. Located in the downtown of Siem Reap, Chhay Long Angkor Boutique Hotel Siem Reap offers accommodations just 1312 feet from the vibrant Pub Street and the Old Market. Modern hotel in a quiet side street near pub street. Very clean. Comfy beds. Located in Siem Reap, a 6-minute walk from King's Road Angkor, Viroth's Villa has air-conditioned rooms with free WiFi. Absolutely superb! I can't list everything that is great about this place. Krissna Villa Siem Reap is peacefully located in Siem Reap. This 2-star hotel offers an outdoor swimming pool and tropical gardens. Value for money, good location and friendly staff. Golden Temple Villa is located in Siem Reap and features free bikes and an outdoor swimming pool. Featuring a garden, the 4-star hotel has air-conditioned rooms with free WiFi. We love everything! The staff are very nice, friendly, and helpful. The welcoming service is great. Nestled within private gardens, Belmond La Résidence d'Angkor Siem Reap offers accommodations right by the Siem Reap River. Everything was just perfect. We were sorry we couldn't stay a couple of days more. Only 2625 feet from the lively Pub Street, Lynnaya Urban River Resort is a beautifully furnished property located in the heart of Siem Reap. Great location, just 10mins to pubstreet by walk. Nice staff too. Nestled within private gardens, Riversoul Design Hotel offers accommodations in Siem Reap. It features an outdoor swimming pool and spa center. The room was spacious and comfortable. The pool was a welcome relief at the end of the day. How much is a hotel in Siem Reap for this weekend? The average price per night for a 3-star hotel in Siem Reap this weekend is ₱ 3,825 or, for a 4-star hotel, ₱ 7,545. Looking for something even fancier? 5-star hotels in Siem Reap for this weekend cost around ₱ 17,327 per night, on average (based on Booking.com prices). 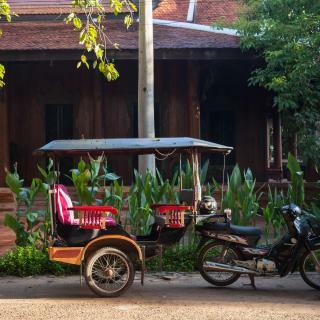 Which neighborhood is the best one to stay at in Siem Reap? 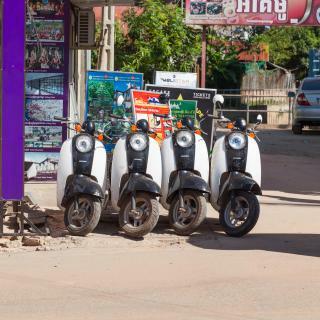 National Road 6, Taphul Village Area, and Charles de Gaulle are popular with other travelers visiting Siem Reap. What are the best hotels in Siem Reap near Angkor International Airport? Travelers who stayed in Siem Reap near Angkor International Airport (REP) have said good things about Botanic Artistry Boutique Hotel & Garden, La Renaissance Boutique, and La Palmeraie D'angkor. What are the best hotels in Siem Reap near Angkor Wat? Some of the best hotels in Siem Reap near Angkor Wat include Yanick's Angkor Cottage, Shintana Saya Residence and Templation Hotel. 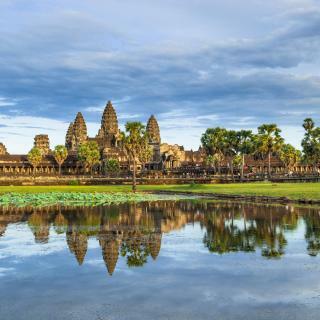 Which hotels in Siem Reap are good for families? Many families visiting Siem Reap loved staying at Golden Temple Boutique, Golden Temple Villa, and Golden Temple Retreat. How much is a hotel in Siem Reap for tonight? On average, it costs ₱ 1,927 per night to book a 3-star hotel in Siem Reap for tonight. You'll pay around ₱ 3,402 if you choose to stay in a 4-star hotel tonight, while a 5-star hotel in Siem Reap will cost around ₱ 8,105, on average (based on Booking.com prices). Which hotels in Siem Reap have nice views? eOcambo Resort & Spa, Khmer Mansion Residence, and Phum Baitang got great room view-related reviews from travelers in Siem Reap. How much does it cost to stay in a hotel in Siem Reap? On average, 3-star hotels in Siem Reap cost ₱ 1,529 per night, and 4-star hotels in Siem Reap are ₱ 2,976 per night. If you're looking for something really special, a 5-star hotel in Siem Reap can be found for ₱ 7,634 per night, on average (based on Booking.com prices). Which hotels in Siem Reap are good for couples? These hotels in Siem Reap are highly rated by couples: Khmer Mansion Residence, eOcambo Resort & Spa, and Golden Temple Residence. Which hotels are the best ones to stay at in Siem Reap? Secondfold Residence, Ladear Angkor Boutique, and Borei Angkor Resort & Spa are some of the popular hotels in Siem Reap. Which hotels in Siem Reap offer an especially good breakfast? For hotels in Siem Reap that serve highly-rated breakfasts, try eOcambo Resort & Spa, Angkor Heart Bungalow, and Khmer Mansion Residence. 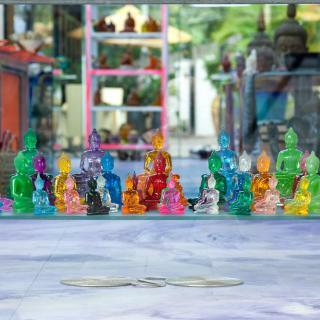 I used to love going to this place, especially Ankor Wat. I used to love going to this place, especially Ankor Wat. The Cambodian people are very wonderful. Unfortunately, the entire area has been overrun by PRC tourists who have ZERO manners and run everything. The Angkor Wat is definitely worth the time. The Angkor Wat is definitely worth the time. Be wary of people who offer to take your pictures. You might think it's just them being friendly, but they actually ask for money afterwards. Also, don't get pressured to buy souvenirs from children who come near your vehicle when you're about to leave. Its my second time to come to Siem Reap, i have many good memories to share with my second trip and have also some unpleasant things that i have encountered when i was there. First, Our Hotel is fine and i really appreciate our host there, always giving 101% of their effort so that we have a good time there. We also came there on Cambodia's New year celebration, a good time to celebrate. Have a great conversations with other tourist as well as locals. Maybe the unpleasant thing we have experience was the weather was so humid and hot. i have to constantly change shirts every three hours. The city itself is good for both, party or relax. The city itself is good for both, party or relax. It all depends we’re you stay. People were always friendly and easy going. The ancient area is amazing as well, I would recommend to go for the short tour of one day. For $18.90 a night (25 aud) it was complete luxury! We stayed in the Superior Double Room. It had Free pick up from the bus station, and a bath & shower! Breakfast included, with an a la cart selection (American breakfast, pastries option, continental, Cambodian/Asian option). Property has 2 pools. Such amazing friendly staff. We extended our stay an extra 3 nights. 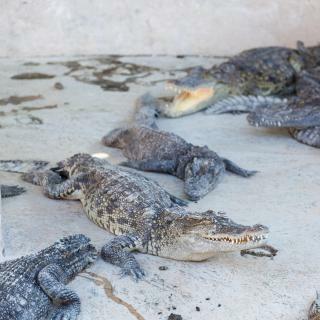 The balcony/walkway in front of 208 has a view into the crocodile farm. Honestly the best value for money we’ve had while in South East Asia. The hotel doubles as a luxury spa getaway and an awesome base for sightseeing everything Siem Reap and its surroundings have to offer. 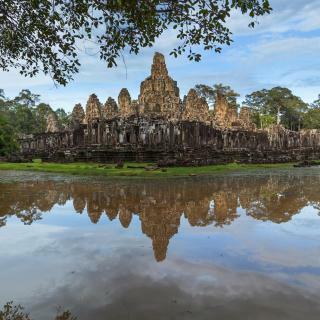 It’s located a mere 5 minutes by tuk tuk from the buzzing city center and a 30 minute drive from the breathtaking temples of Angkor Wat. The rooms are spacious and spotless, the pool area inviting and nicely designed; the breakfast is delicious and varied with both local and Western staples. The staff went out of their way to accomodate our needs during every interaction. Clean, attractive premises and attentive bar and restaurant staff. After visiting several other establishments in Siem Reap, I can safely say that this was one of the nicer hotels in the area, and a great value for the price. The concierge service was also very efficient and honest -- I especially appreciated the candid and concise advice of the head bellhop, who also picked us up from the airport. I would not have chosen a different hotel. The hotel was an oasis of tranquility very close to the centre of Siem Reap. The staff, all Cambodian, were all very friendly and eager to please. We arrived early in the morning and were greeted by Achou who gave us the use of a temporary room to freshen up until our booked room became available at 2pm. The hotel provides complimentary tea everyday between 4 and 5pm. They alsi provide a a complimentary taxi to/from the airport. The staff were wonderful, they were communicative from the booking and catered to our every need. They couldn't do more to make our stay any better. The hotel felt like total luxury with comfortable beds, perfect pillows and great air con. The shower was possibly the best I've ever used! Our driver, John, is regularly used by the hotel- we thoroughly recommend him, his smiles kept us happy for the all days of our stay. EVERYTHING! The staff, the service, the price, the food, the location, and the facility. This boutique hotel were above and beyond what we expected for the price. I can't say enough good thing about it. It's a MUST stay when visiting Siem Reap. Thank you Golden Temple Villa and Lucky (the manager) for making our vacation extra memorable. It's a wonderful family property exactly what we need for a siem reap trip. Staff and owner shows cordiality and open-mindedness and very hepfull for our stays. The swimming pool was clean and refreshing after a hot day excursion. We travelled in differents cities in Cambodia and Hak B Hotel was the bestest one. Hostel is brand new, twin room is huge with huge beds (we slept both in one of them) and there is a BATHTUB (room 777)!!! Location is ok, breakfast is good, wifi is fast and the chill area with the pool is nice. We stayed in 3 different hotels during our stay in Siem Reap and this one was the best. Great, friendly stuff, the highest possible customer service Beautiful, spacious,luxury suite Lots of extras such as beverages, snacks, fruits The best location by the pub street but still quiet indoors I highly recommend the hotel to stay in once you go to Siem Rep and Angkor Wat. Wow, this is 5 star service for an unbeatable price! We loved everything about this hotel, it was a little slice of paradise in the perfect location and had everything to offer. Best value for money and I would recommend to anyone looking for a treat in Siem Reap. Small Cambodian hotel with character with lovely staff. The pool was a delight after a hot days sightseeing. This is Cambodia - if you want luxury Western accomodation, book an anonymous chain and be anywhere in the world! I have traveled to Siem Reap quite often and found out Angkor Paradise Hotel is one among the best. Feeling at home here. The facilities/amenities within the villa are very well thought out - always replenishing towels, providing ample deck chairs and lounge areas, water is always topped up. The staff were lovely and helpful, always wearing a smile - they were never intrusive and always came to make up the room just as we went out for meals (even though we spent most of our time in our villa). 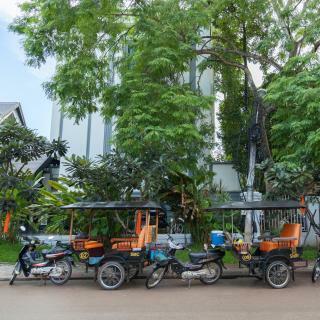 The Tuk Tuk rides into the town made it convenient and affordable to sight see and visit restaurants. Dinner at Hang Bay was fantastic, especially the Cambodian Amok. Besides having beautiful rooms and exceptional amenities I'd have to say the staff throughout made this hotel a delight to stay at ! Very attentive very genuine , and really made my stay memorable. I am so looking forward to returning to this hotel . The breakfast buffet is very nice and atmosphere very relaxing , the ladies in the buffet were so wonderful and always smiling and just delightful to see each morning . This is a brand new hotel too so everything is perfect . Everything this hostel was good. Owner is the nicest man. Staff is friendly and very helpfull with everything. Clean rooms and bathrooms. Place has perfect balance of party and relaxing. Food in a resturant tasted good and it was cheap. This is simply very good place to stay. Staff is fantastic. Breakfast tasty and fresh! And pool lovely.